Explorer characters gain Toughness +1. Resolve story struggles in the order of your choice for the story card at which an Explorer character you control is committed. The subtitle, "Nothing but Trouble," seems like quite the misnomer. 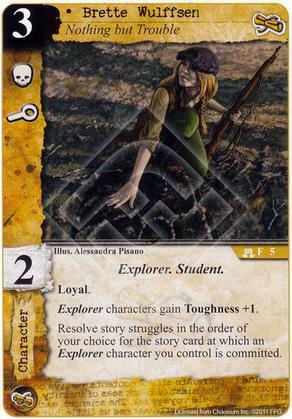 She's a Student, she makes your entire expedition team tougher, and she gets you out of some terror and combat struggles that you'd rather avoid. And she doesn't hurt your cause. I know professors like to hate on their students, but as Vincent Gambini once said, I think a modicum of gratitude would not be out of line here. She is very solid. I mean she is no Roald Ellsworth, or Matthew Alexander, but she is still a fun part of the explorer pack. The fact she grants toughness is probably not as valuable as the icon reordering, I often find that the toughness thing just means that she dies first. But the icon struggle reordering is very sweet, and can cause all sorts of headaches for your opponents. Certainly not "nothing but trouble," right? Maybe trouble for your opponents?